With a small yard and a tiny deck, I never dreamed I would have a greenhouse. 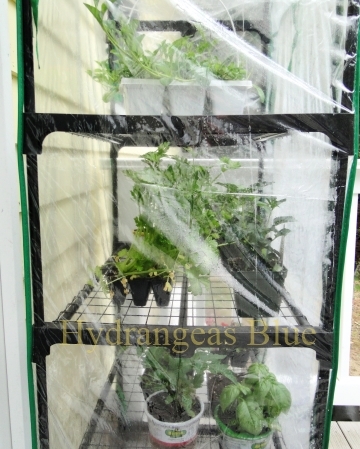 It’s not exactly what comes to mind when you say “greenhouse” but my mini-greenhouse does the job. It fits nicely in the corner of my deck, up against the house (so it won’t blow over in a strong wind), and it holds plenty of seedlings. This year it is nearly full, with tomatoes, eggplant, peppers, zucchini (courgettes), parsley (already planted in my raised bed), and flowers. I didn’t start anything from seeds this year, but I’ve purchased a grow light so I can start seeds indoors next April. Then I’ll move them out to the greenhouse in May. That’s my plan anyway. A few weeks ago I went to House by the Side of the Road in Milford, NH and bought my tomatoes and a few pepper plants. The other veggies and some flowers I bought at Tenney Farms in Antrim. I don’t ever have luck growing peppers, even though I’ve read all kinds of helpful tips. I have fewer tomato plants this year too. The “Celebrity” type seems to give me a nice crop, so I am sticking with that kind. And of course the small, grape tomatoes too. I’m the only one in the household who will eat them, and last year I had too many! 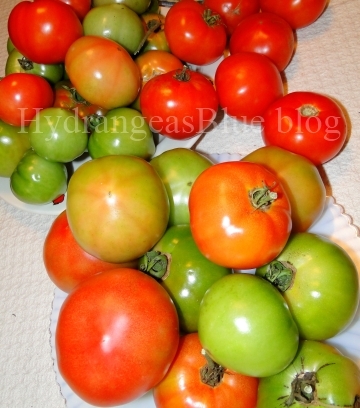 Last year’s tomato crop, end of season. That’s an awesome greenhouse! Happy planting! !